Grammy-nominated rapper Nipsey Hussle was shot and killed outside his clothing store on Sunday, March 31. Hussle, born Ermias Joseph Asghedom, was 33-years-old and was shot in South Los Angeles’ Hyde Park neighborhood. Two others were injured in the shooting. Hussle founded the record label All Money In in 2013, which he debuted alongside his fifth official mixtape, “The Marathon.” In the past, he has teamed up with other artists such as Kendrick Lamar, Drake, YG, Ty Dolla Sign, Meek Mill, and Young Thug. His Grammy nomination came this past year for best rap album, but he lost to Cardi B. The rap star was not only involved in music. Hussle was a strong advocate for stopping gang violence and activity in South Los Angeles. While he used to be a part of a gang himself, his Facebook page reading that he was “a devout member of the Rolling Sixty Crips,” a national street gang founded in LA in the mid-1970s, Hussle was working with the Los Angeles Police Department (LAPD) and LA County Board of Supervisors to discuss ways to help stop gang violence. He had been scheduled to meet with LA Police Commissioner Steve Soboroff and LAPD Chief Michael Moore the Monday after he had been shot, April 1, to speak about these issues. That Monday night, about 300 people gathered for a candlelight memorial in The Marathon Clothing parking lot, right where the rapper was shot, to mourn his passing. The vigil was interrupted, however, when someone with a gun spurred mourners to start running in several different directions, according to police. Gunshots were reported initially, but police quickly denounced those reports. A commander near the scene hadn’t heard any gunshots, and Chief Moore said he was “lacking information that a shooting occurred.” Nineteen people were still injured and transported to a hospital as the vigil turned into a panicked stampede. None of the injuries were from gunshots. Two days after the shooting, on April 2, police arrested a man who was suspected to have carried out the shooting. Eric Holder knew Hussle, according to LA police, and the shooting appeared to be a product of a personal vendetta. The details of this feud were not released to the public. According to witnesses, Holder approached Hussle and others multiple times, engaging them in conversation, before pulling out a handgun and repeatedly firing at the men. 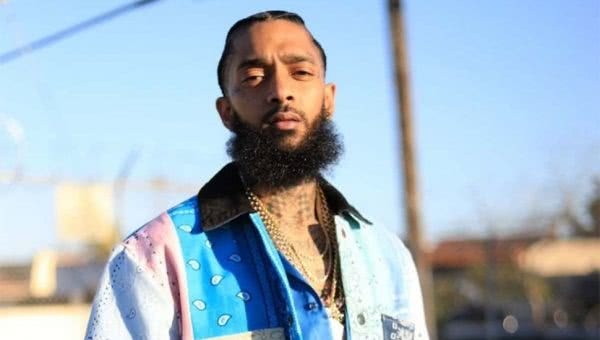 The other two men who were injured and Hussle were all transported to a hospital, but Hussle was pronounced dead while there, while the others remained in stable condition.